In his essay, A Lawless Proposition, Paul Chan discusses the perpetual question of why (and how) art comes into being, and touches on a particular phenomenon that some artists engage in their work, at times against their will – when the process of making creates the work of art itself: “By following the contours of this internal reasoning, a work takes on an uncanny quality that comes from it being an outgrowth of the experience of something becoming aware of becoming itself.” Fleisher/Ollman’s current exhibition Alchemy, Typology, Entropy: Adam Lovitz, Peter Allen Hoffmann, Alexis Granwell – described as “three miniature solo shows by three Philadelphia artists” – opens up a three-way conversation between these makers and their objects. Each artist maintains an individuated commitment to both the physical act of creating and form, yet allows a freedom of invention and innovation to occur when the work is removed from its native studio habitat. The resulting works move beyond a representation of distinctive concepts and images, and communicate an experience with process that is individual to each artist. For both Lovitz and Granwell, giving work the agency to have a hand in its own creation feels like an active part of their practice. Granwell’s sculptures are simultaneously raw and self-contained, their exposed surfaces laying bare the material process involved in their making. Using a combination of papermaking and papier-mâche, Granwell builds the flesh of these forms on top of wire armatures, creating a surface that sensitively maintains a history of its own creation. 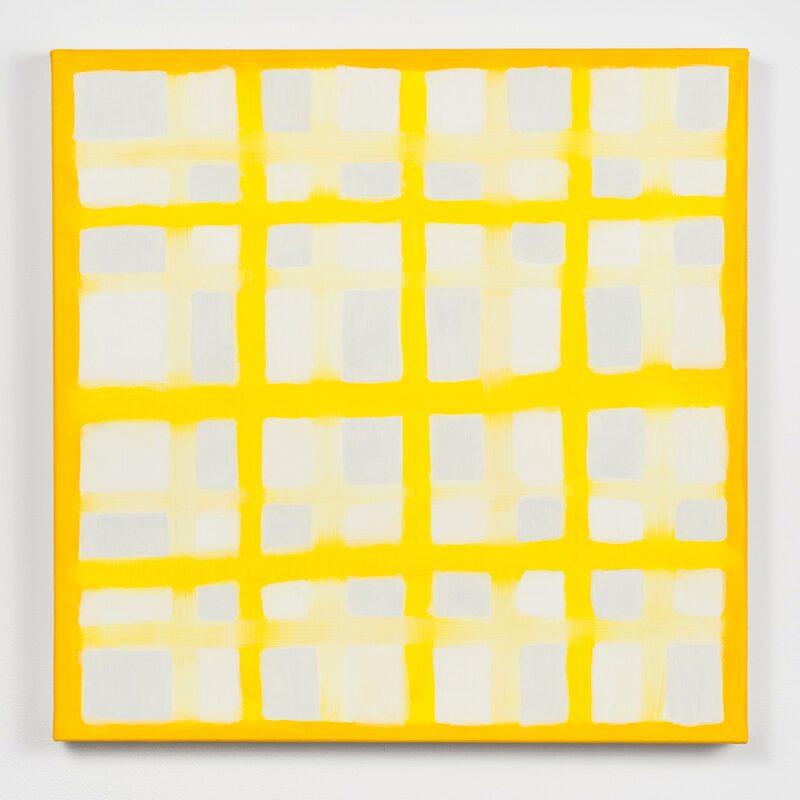 She employs the same kind of dualistic, physically intimate yet violently fleshy sensibility that Eva Hesse developed, combined with a loose but committed interpretive attachment to the pedestal-bound form. Her molded forms sit atop a range of unique pedestals that richly inform the viewer’s experience and physical relationship to the work. In Holes Unearthed, a spindly tripod supports a mottled, rock-like form hovering low to the ground, its angled pose suggesting an awkward, continuous, three-legged trek towards the back corner of the gallery. In contrast, Invisible Eye’s pedestal elegantly houses a gentle, intestinal form with an incomplete circle cut from plywood that seems to cradle it gently from below. At times referencing the figure, both whole and fragmented, their systems of internalized gesture maintain a specific balance that keeps them poised atop their pedestals. Mending Hole undulates with changing perspective, its interconnected arms opening and closing spaces within it as the viewer orbits around it. Up close, the surfaces of Granwell’s sculptures are like scabbed skin or a porous lichen, simultaneously growing and falling apart. This aesthetic is similar to Lovitz’s, whose paintings are crusty and organic, maintaining a palimpsest of his studio process of gathering, mixing, pouring, scraping, and re-collecting. In his practice, Lovitz embraces ruination in a way that doesn’t engage in fetishistic fantasy – he presents the aesthetic of decay in urban spaces as its own microcosmic system, one with autonomy and resonant power independent of either nostalgia or social judgement. Both Fish Stick and Future Still Life include what seem to be lettering lifted from street signs, emerging from beneath a well-worn surface of caked paint and various found materials – specifically schist, a grainy metamorphic rock that Lovitz sources from the Wissahickon Park. 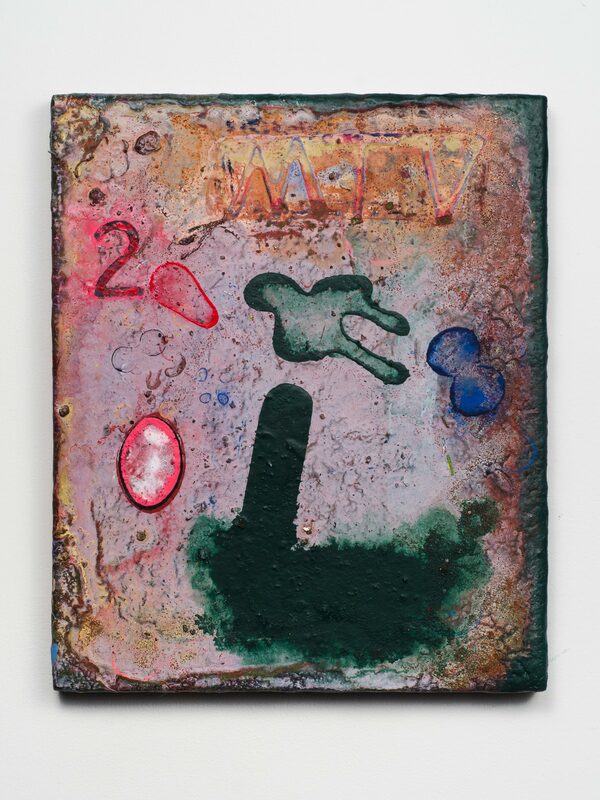 Lovitz communicates in the language of residuals: scrapings, sandings, findings, and scraps are collected and reapplied, developing his scarred surfaces with remnants of imagery alternately bubbling up and occluded by the undulating murk. Without explicit narrative references, Wet Grass and Green in the Face are like surrealist portals into other dimensions, the heavily worked surfaces with dense, earth-bound histories opening up at fissure points to reveal strange celestial moments. In this way, his recent work shares a sensibility with fellow Philadelphia artist (and one of Lovitz’s teachers at PAFA) Neysa Grassi, who also explores the limitless textural and spatial potential within careful accretion and subtraction of painted layers. 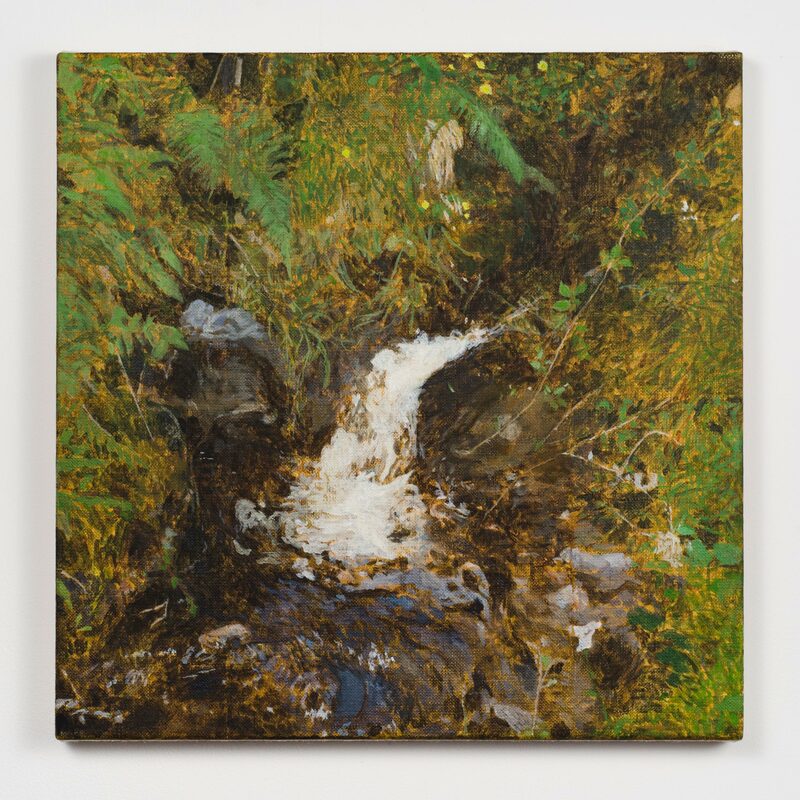 Both artists maintain a fluid relationship between the earth-bound feeling of organic surface and the supernatural, like alchemists fastidiously working towards a magical goal. In contrast to these idiosyncratic sculptures and paintings, Hoffman’s painting do not bring the same kind of ecstatic dedication to evolving morphologies, and take a distinctly cerebral approach to their formation, although the artist’s connection to materiality is clear in the well-crafted compositions. His paintings – all either one foot or six foot squares – maintain seemingly flawless surfaces, the paint meticulously applied in smooth, thin layers, giving each piece a glowing vibrancy. Inspired by vernacular and folk art, several of his paintings take on the form of textiles, specifically the irregular geometries of the serendipitously modernist Gees Bend quilts. Carrying and Untitled maintain a gentle tensity in their gridded compositions with subtly undulating color variations moving the eye around the canvas. Hoffman’s combination of design-oriented colorways and art-historical riffs are carefully crafted and balanced, at times at odds with the embrace of chance that vibrates within work by Granwell and Lovitz. This tension provides an important counterpoint to the exhibition, keeping engagement with material and form relevant to larger considerations of the art historical narratives that each of these artists engages. By constantly forcing the viewer back to the space of the gallery, getting caught up and lost in the materiality of the work is not an option, and seeing the pieces as they operate with and around each other is more at the forefront. Granwell’s sculptures open up onto Hoffman’s geometric surfaces, framing them in surprising ways. The smooth and gentle patinas of Hoffman’s small canvases are punctuated by the heavily-scarred surfaces of Lovitz’s similarly scaled paintings. While identified as individual exhibitions, Alchemy, Typology, Entropy creates a common space for each of its three artists for a collective exploration of practice and meaning. The work within, simultaneously formal and playful, invites itself to be interpreted anew, both as a clear extension of its maker’s carefully considered practice and as a product of its own logic.